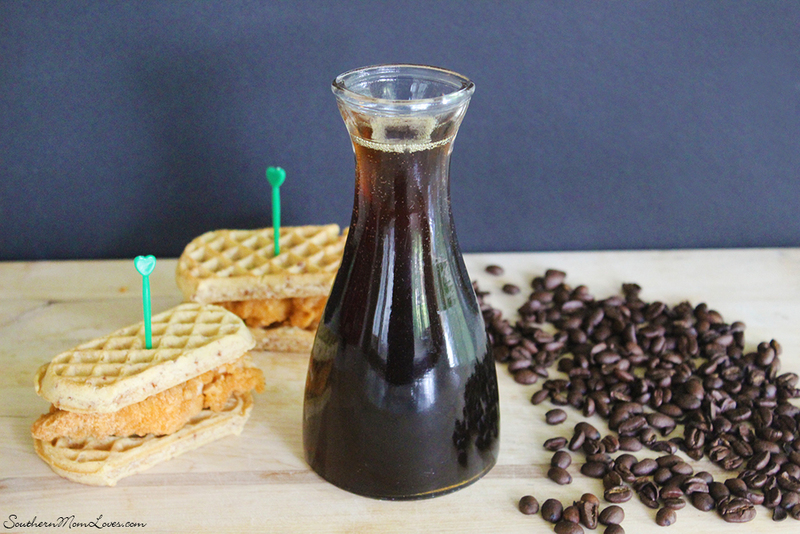 Football season is officially here and I have a great tailgating breakfast for you: Chicken & Waffle dippers with an amazing vanilla and coffee-infused syrup to help you wake up and get going. 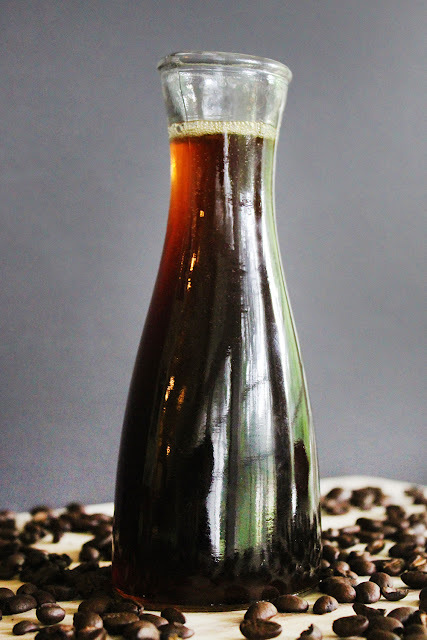 Oh my gosh y'all, this syrup is the stuff of coffee dreams! 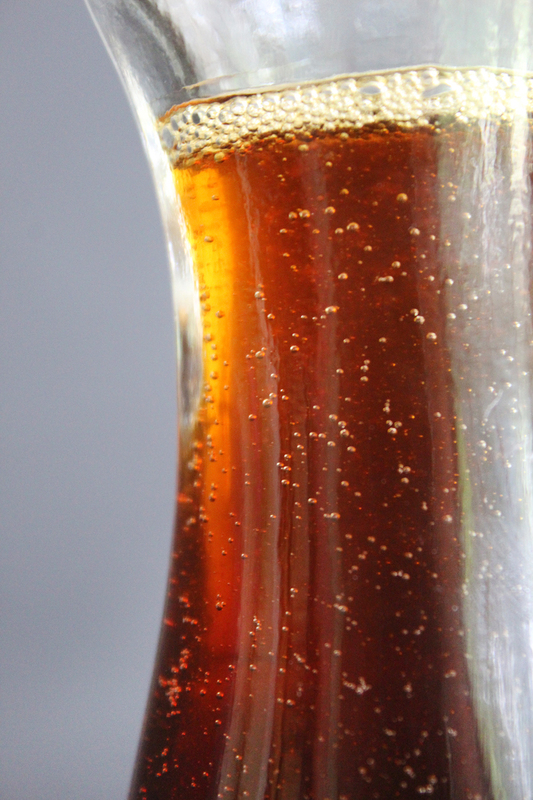 It is so easy to make and will knock your socks off with its deep, rich, mocha-vanilla flavor. I'll also tell you how you can get the chance to win an all-expense-paid trip to Houston for the Big Game, so keep reading! First off, I'm using Community Coffee in my syrup recipe. I was born in Southern Louisiana and I remember this coffee being a staple in everyone's home, not to mention just about every restaurant in the state. It's just that good and there's a blend for anyone's taste. This year, Community Coffee Company is partnering with Southwest Airlines® for its annual Instant Win Sweepstakes game and sweepstakes, Tailgate Traditions. From July through September, fans will get a chance to win an all-expense-paid trip to Houston for the Big Game along with over 500 instant win prizes. 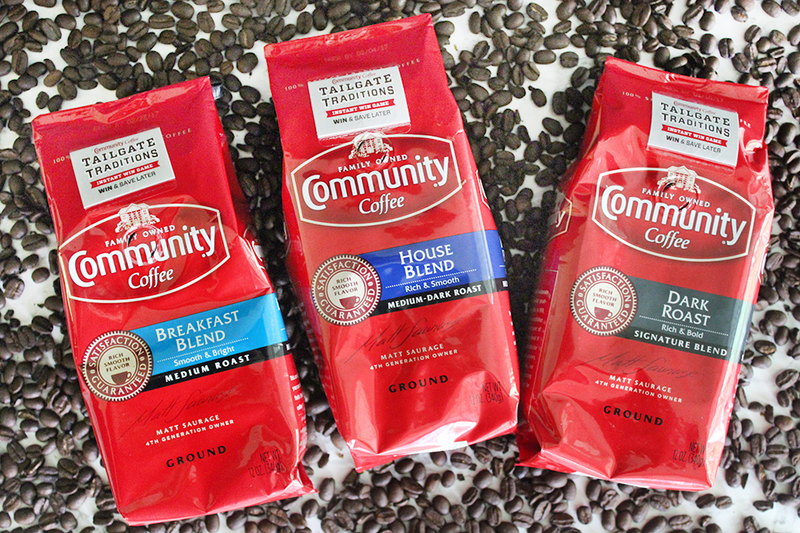 To participate, purchase specially-marked packages of Community® coffee. The packages will feature an on-pack sticker (like the one shown above) containing a unique game code, which can be entered online at TailgateTraditions.com for the chance to win. In addition to saving 55¢ on a future Community® coffee purchase, participants are eligible to win a variety of instant win prizes like Flat Screen TVs, Keurig® Brewers & Coffee Bundles, Outdoor Grills, and Southwest® gift cards. 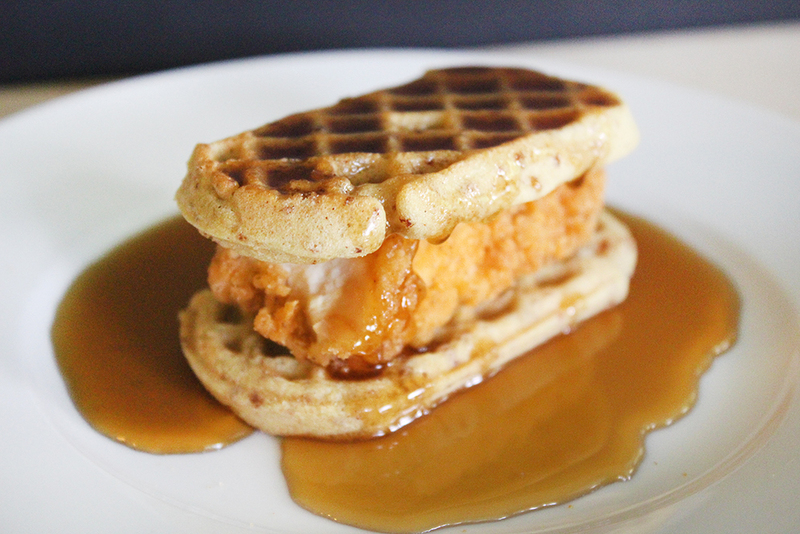 So in addition to being able to make this delicious syrup, you'll also get the chance to win cool stuff! Score! The Chicken & Waffles are easy-peasy to assemble. 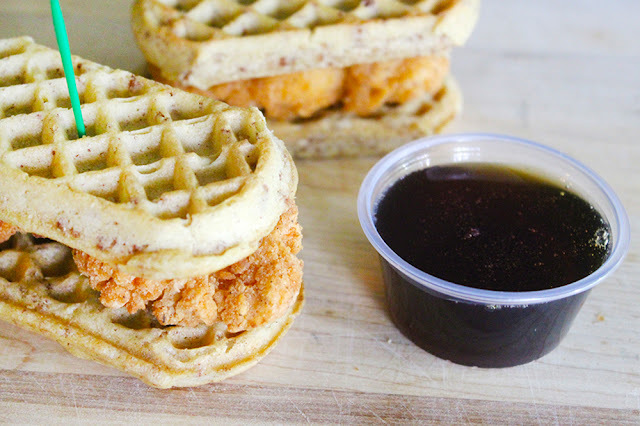 I'm using store-bought chicken tenders and waffles, but if you have the time you can fry the tenders yourself and make homemade waffles. 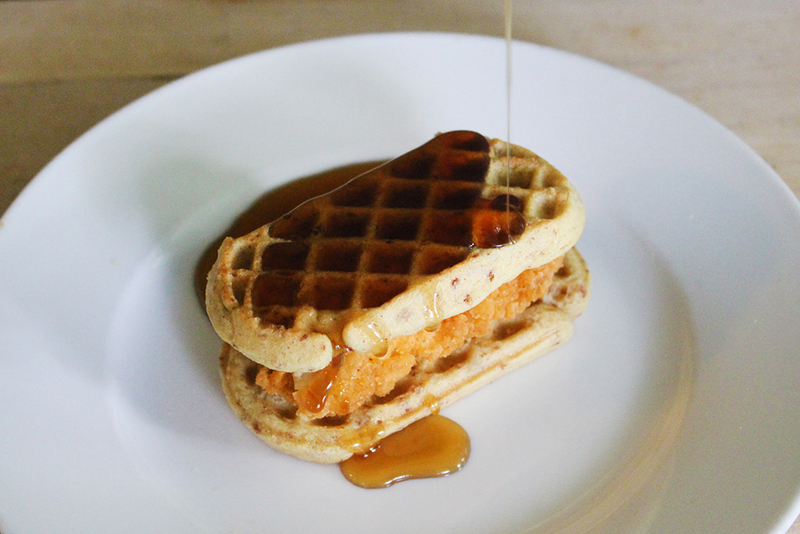 If you have a square waffle iron, just cut your waffles in half to assemble a "dipper." The syrup is the star here. It's a gorgeous rich, deep amber color, flavored with vanilla and a hearty dose of strongly-brewed coffee. I used the Community Coffee Dark Roast, about 2 Tbsp. of ground coffee for every measuring cup of water in the brewer. Make a little extra and have a cup while you assemble and you'll be done in no time! Brew a strong batch of Community Coffee, about 2 Tbsp. of ground coffee for every cup of water. In a small saucepan, stir together the white sugar, brown sugar, and coffee. Bring to a low simmer and cook for about 3 minutes, stirring constantly. 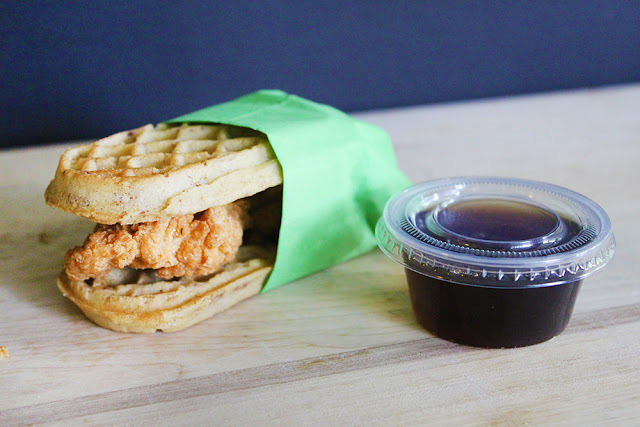 If you're packing these for tailgating, wrap each heated chicken & waffle dipper in a napkin and lay them in rows in a warmed covered casserole dish. If you don't have a thermal carrier, wrap the covered dish in a towel for transporting. Pour your room-temperature syrup into lidded cups and you're all ready to go! Mmmmmm. *drool* If you love coffee, you will love this coffee-infused syrup! I hope you enjoy this recipe and be sure to check out Community Coffee's game day recipes here. What are some of your favorite game day dishes? Will you be making mine? I love to read your comments!